What started with 16 is now down to eight as half the masks in this year’s playoffs have advanced on to round two. 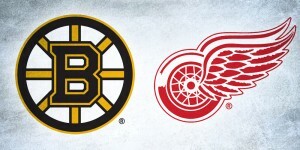 Some of our first round picks proved true, while others (looking at you, Chicago) not so much… Last year’s champion, Martin Jones, was eliminated at the hands of the Oilers, so the field is now wide open for anyone’s taking. 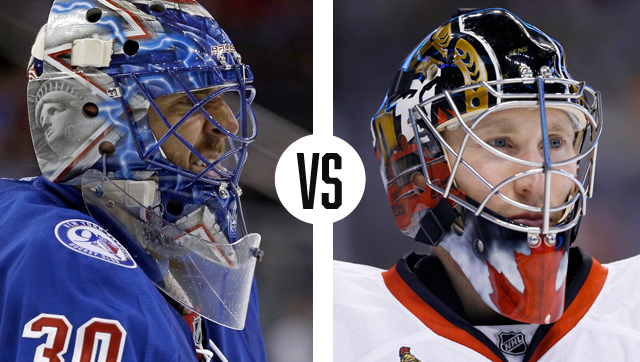 As we continue through each round, we’ll be pitting the starting goaltenders’ masks up against each other in matters of branding, composition, and overall aesthetic value. 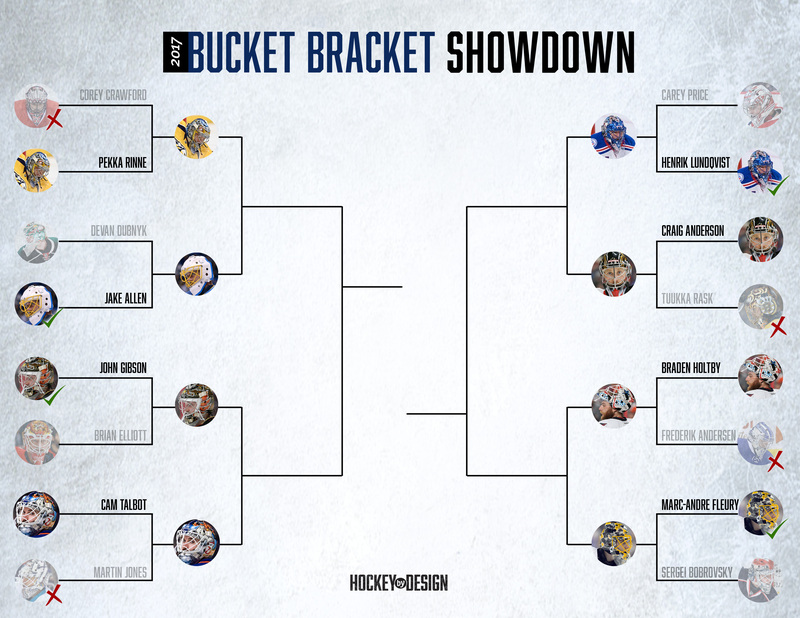 Now that the conference semifinals are underway, let’s break down the second round match ups and see which buckets would prevail. To see how our picks are doing so far, check out the full bracket and catch up on the full round one analysis here. 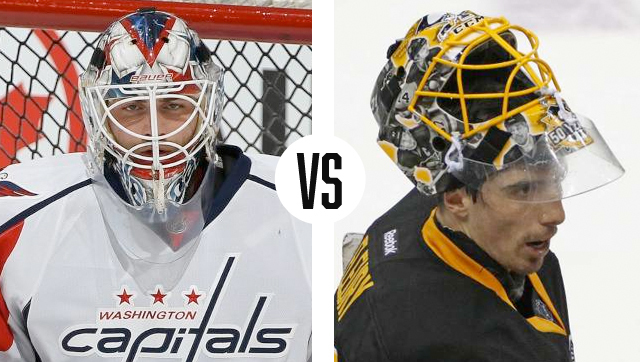 Nothing says playoff rivalry like a Capitals-Penguins series, and the postseason almost wouldn’t seem complete without one. 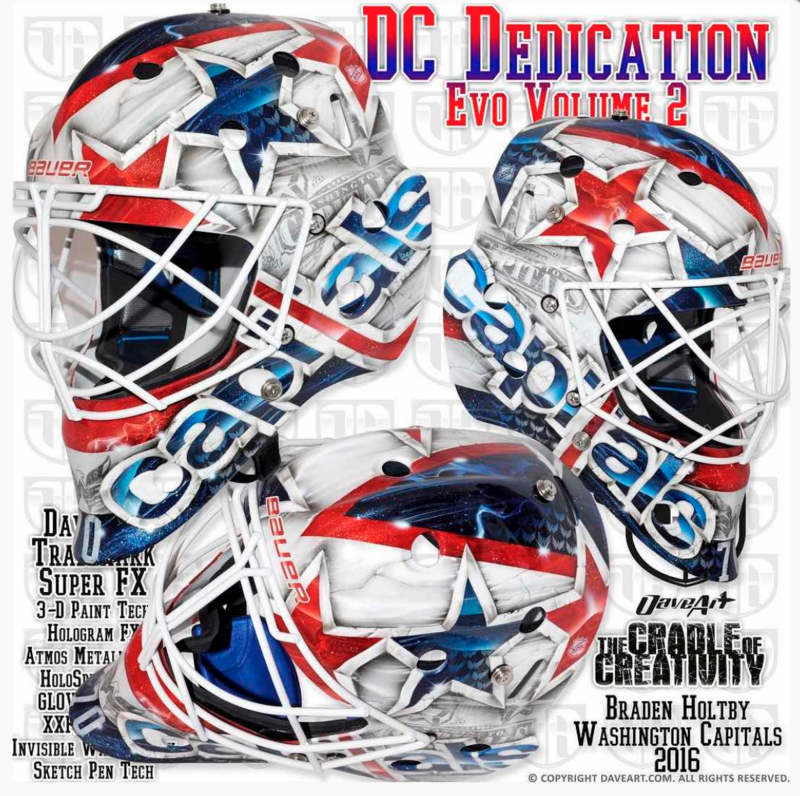 Vezina finalist Braden Holtby and his patriotic Daveart mask take on MAF’s teammate tribute bucket to kick off round two. Titled “DC Dedication Evo vol. 2,” a sequel of sorts to last year’s design, Holtby’s mask hasn’t strayed much in composition over the past few seasons. 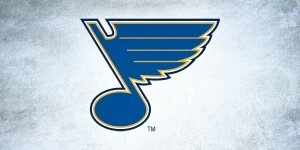 “This new design goes in the well known Holtby style,” Gunnarsson shared, “and here created in a subtle vintage style.” It incoporates the Caps’ wordmark with past Capitals logos ghosted in the background to create a layered, intricate design. 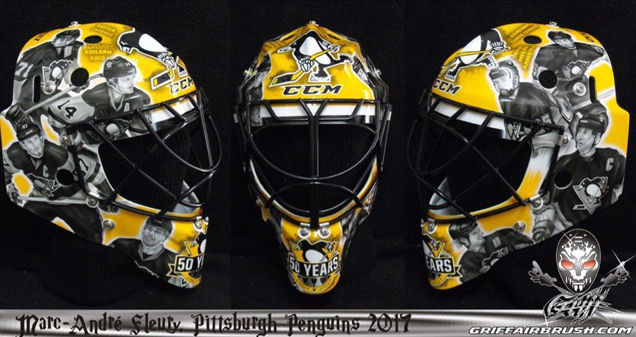 Fleury’s mask is much more two-dimensional, although no less artful or aesthetically pleasing. A tribute to some of his most esteemed teammates, the all yellow bucket is covered in beautifully executed black and gray portraits of Penguins past and present. Holtby may take the cake as far as representation of team branding, but the simple concept and crisp execution of Flower’s tribute take this series in the end. After knocking off Montreal in the first round, Hank and the Rangers are up against Craig Anderson’s Senators in round two. 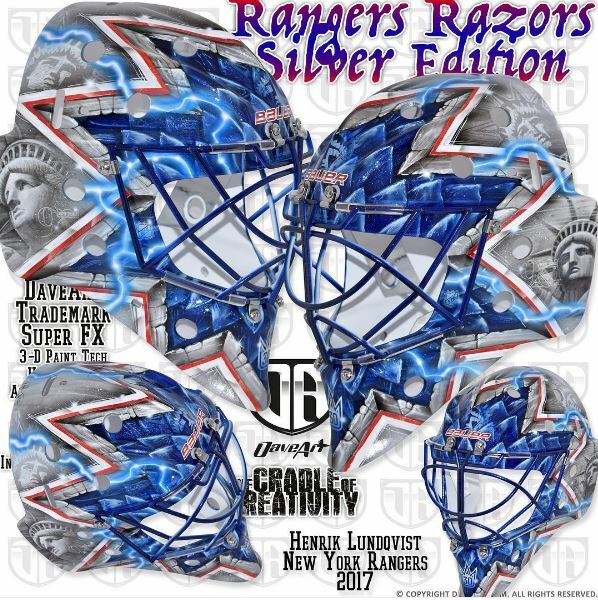 The second of Lundqvist’s playoff masks by Dave Gunnarsson, the latest iteration of the razor design boasts loads of special effects like holograms and lightning bolts over hyper-realistic grayscale imagery of Lady Liberty. The broader composition here is much simpler than many of Hank’s prior masks, letting the details recede into the background from afar but adding visual interest up close. 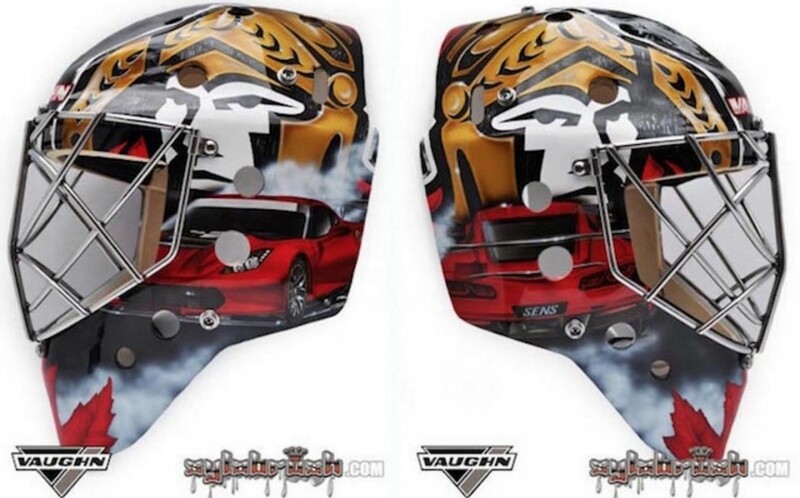 Craig Anderson’s Sylabrush bucket is simple and clean, featuring large Senators logos and Corvettes on each side along with a maple leaf on the chin. The lack of clutter on this mask allow the main design elements and beautiful execution to really stand out, but the visual interest and depth of Hank’s take the cake. 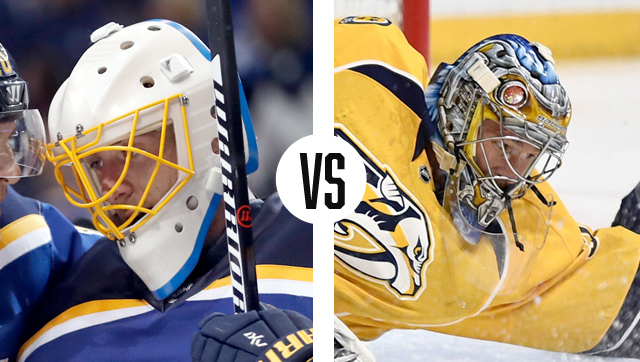 With two quick series in the first round, the Blues with a 5-game win over Minnesota and Nashville with a stunning sweep of Chicago, Jake Allen takes on Pekka Rinne in round two for a battle of the blue and yellow buckets. While these masks may use the same color palette, they couldn’t be more wildly different, and aesthetically, we have a very clear winner. 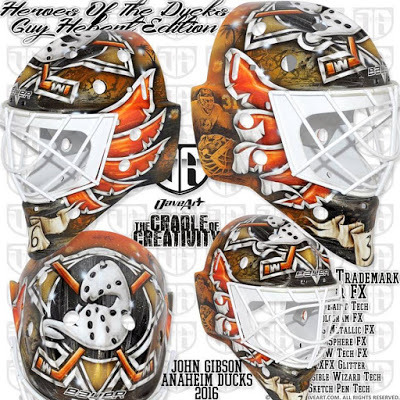 Allen’s vintage-inspired mask, painted by Jason Livery, drew mixed reviews for its graphic and stark design, even some mixed feelings from the artist himself. Livery shared on Instagram, “all the years I have painted Jake’s masks, this white one is my least favorite.” He added, “he [has] a very simple old school taste so that’s what I do,” but whether the look appeals to your taste or not, there’s no arguing that the simplicity reads easily from afar, plus it looks incredibly sharp with the entirety of his setup. 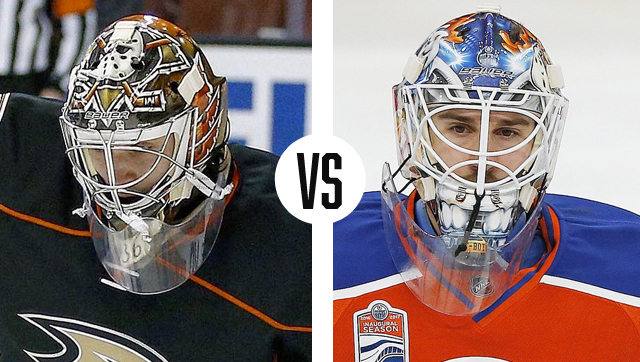 We only have one Daveart-versus-Daveart matchup in round two, and it comes out west between John Gibson and Cam Talbot. While these masks are actually quite similar in style, their subject matters couldn’t be more different. 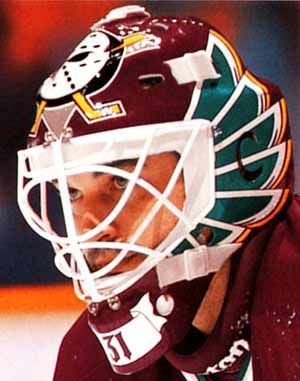 Gibson’s mask pulls direct inspiration from the OG Ducks’ netminder, Guy Hebert’s. 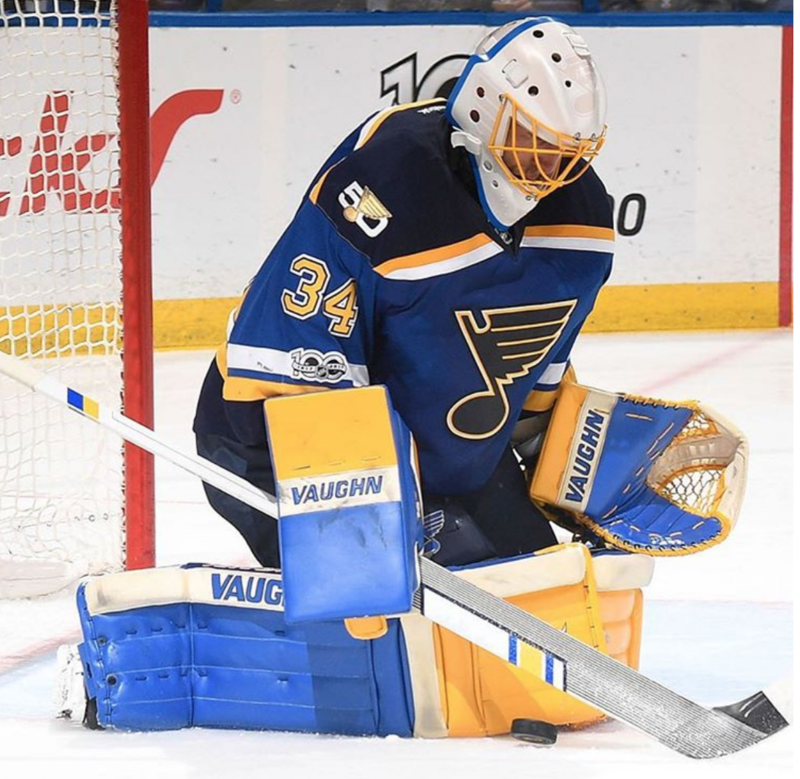 The Mighty logo on the top, wings on the sides and banner containing Gibson’s number on the chin are all pulled directly from Hebert’s, yet Gunnarsson has applied his signature high-tech style to give the mask some modern flair. 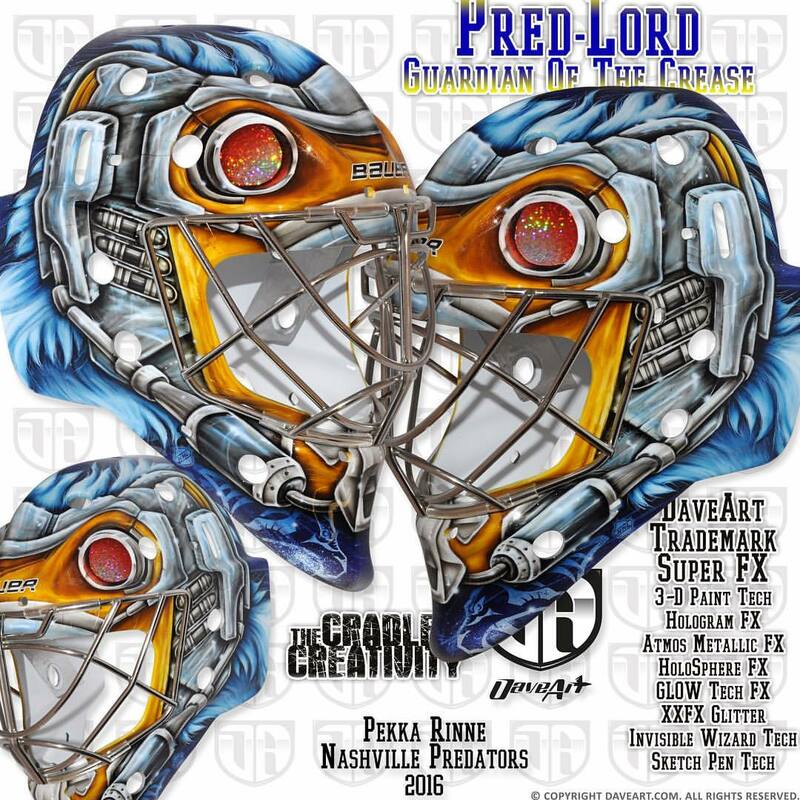 Talbot’s mask is also full of Daveart flair, with glow-in-the-dark acccents and plenty of detail. 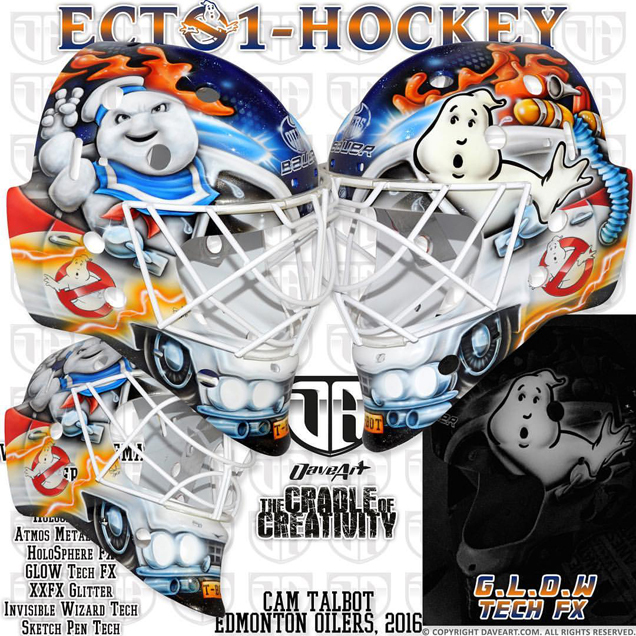 The Ghostbusters theme bucket is both innovative and fun, stacking up tough against Gibson’s Hebert homage. It’s a true showdown of tribute versus creativity, but in this Daveart battle, creativity emerges victorious. 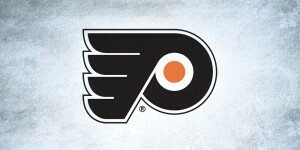 I think the only reason Jake wears this mask is because he is superstitious,he won a few games and stuck with it. Goalies are a weird bunch aren’t they.